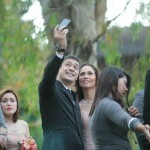 Mommy Maricel | He can catch you! 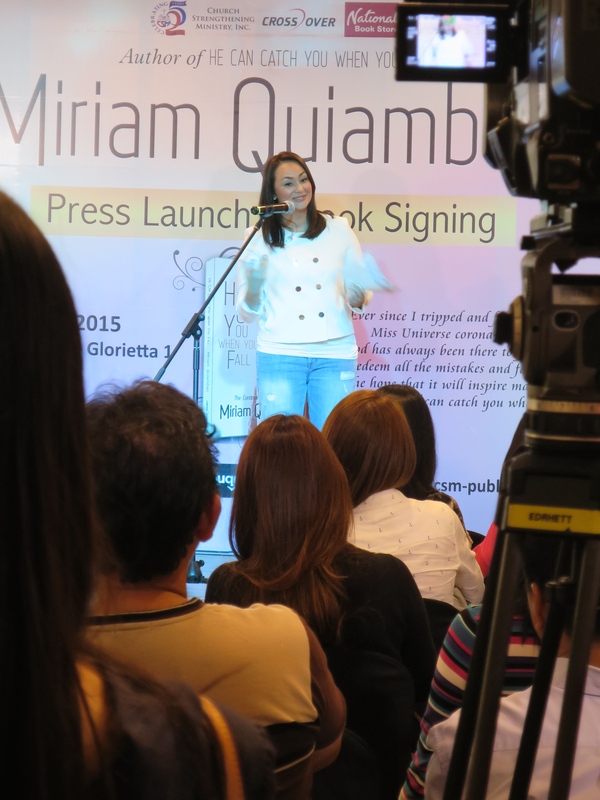 I’m so proud of my friend, Miriam Quiambao for the official launch of her book yesterday. 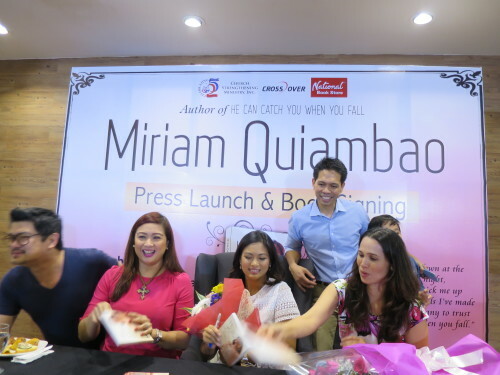 He Can Catch You When You Fall , published by CSM Publishing provides the reader Miriam’s journey from her glory days as having been the Philippines’ representative to the Miss Universe, coming home making her country proud when she was chosen as the 1st Runner up and then soaring as a media personality. 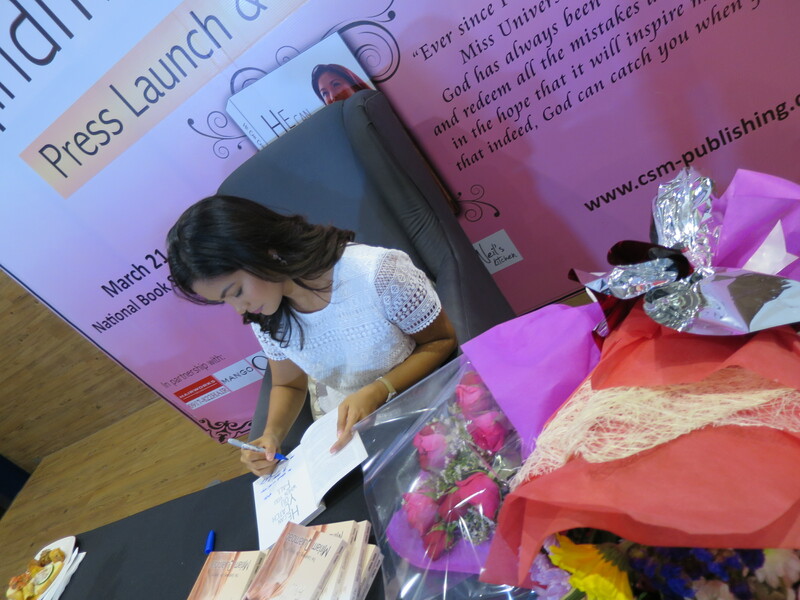 She pours her heart out in this book to provide a picture of what transpired in her fairy tale marriage that turned out to be a broken dream and many more failures after that and how she was able to pick up the pieces by God’s grace and rise again to where she is now. It was a full-packed event at the National Bookstore in Glorietta 1 as friends from the media, church and family came to support Miriam to this momentous event in her life. 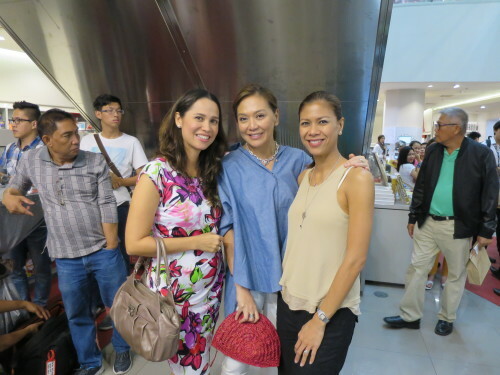 Here in photo with me are Karen Davila and Suzie Abrera. It was heartwarming to hear Karen talk about Miriam from how she knew her from way back when she was still in GMA-7 and to provide encouraging words of inspiration to all of us in the audience. Donita Rose, who hosted the program attests to the fact that she was intending to just skim thru the book but ended up reading it in one and a half days because she was intrigued by all the juicy bits of information about Miriam’s life. 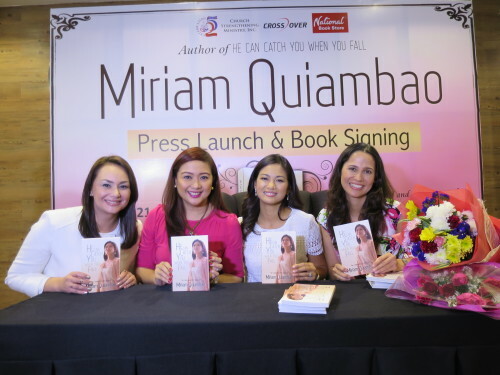 Donita found herself bewildered at the fact that Miriam could have the courage to share all those that she wrote in the book because normally, as a media personality there are certain parts of one’s life that are better unshared for the fear of being misinterpreted or used in a negative way. But not Miriam. 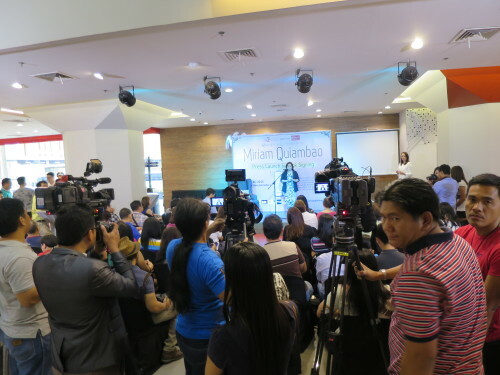 She went all out to tell the truth and nothing but..
Miriam boldly acknowledges her faith in God that kept her sane and then helped her to pick up the pieces one by one. It is a sight to behold Miriam as a new wife to Ardy Roberto who has been instrumental in allowing her to see her full potential as an author and mother to Josh who now completes her new family. We are just so happy to see Miriam the person that she is now having known her from her glory days, to her not so glory days and then today. It was a riot when we came together for this photo as Tin Bersola, (who has been a dear friend of mine since our elementary school days) and I fussed at all the nitty gritty details of taking this photo from the backdrop, the poses and all for the full-force promotion of the book we are so proud that Miriam has written. Here in photo also are Julius Babao and Ardy Roberto. The ladies just had to take this photo with Donita, Tin, Miriam and Myself. 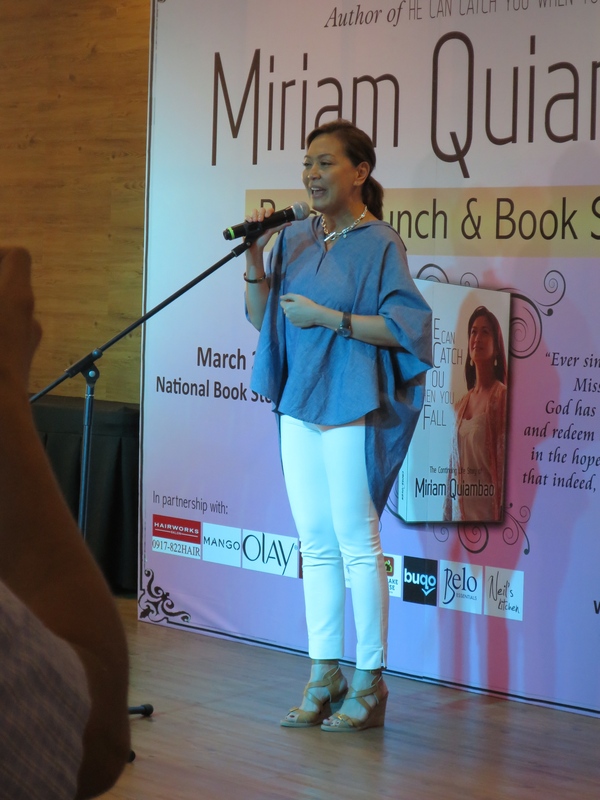 Tin and I have had our share of book launches having written several books as well and we are looking forward to when Donita will launch her own book in the near future! 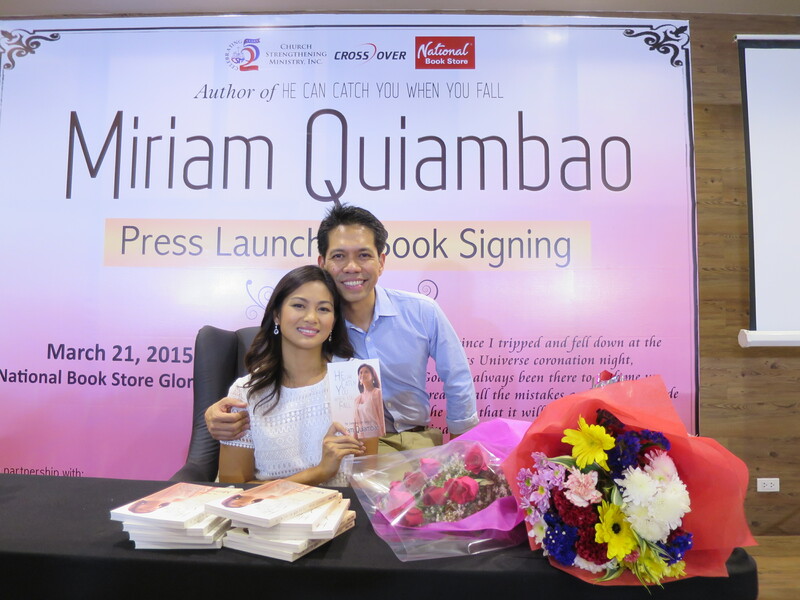 I bought 10 copies of Miriam’s book and I had her sign all of them for me to give away. So, if you have reached this part of the blog and comment below that you want one, well I shall send you one! I will choose 5 to give in this blog. Just comment on why you think you want one and what area of your life you want the Lord to catch you! Go for it! I’ve been following your blog in recent months, and it’s been fun reading your posts. 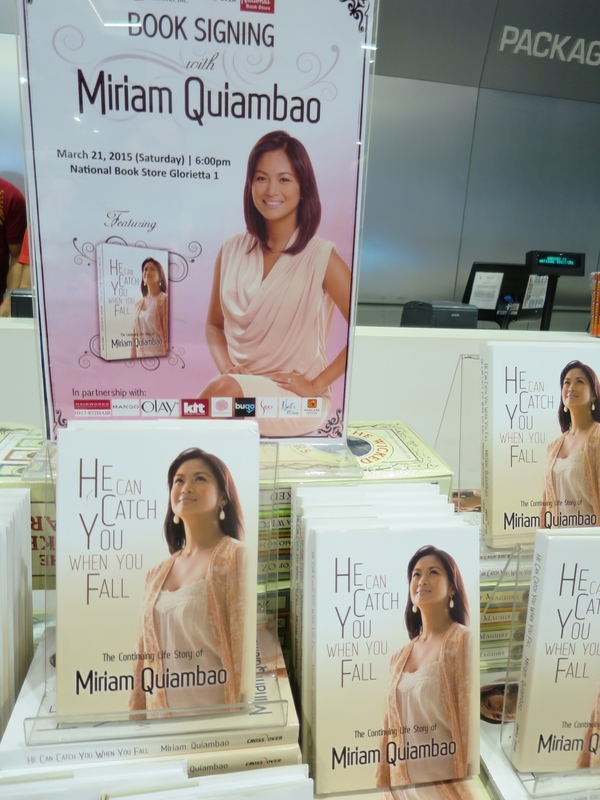 Incidentally, I’ve also been reading some news articles about Miriam’s book ‘He Can Catch You When You Fall’ recently, and I said I want to get a copy of it. I first checked the two mall stores of National Bookstore here in Bacolod City, but they don’t have it yet. 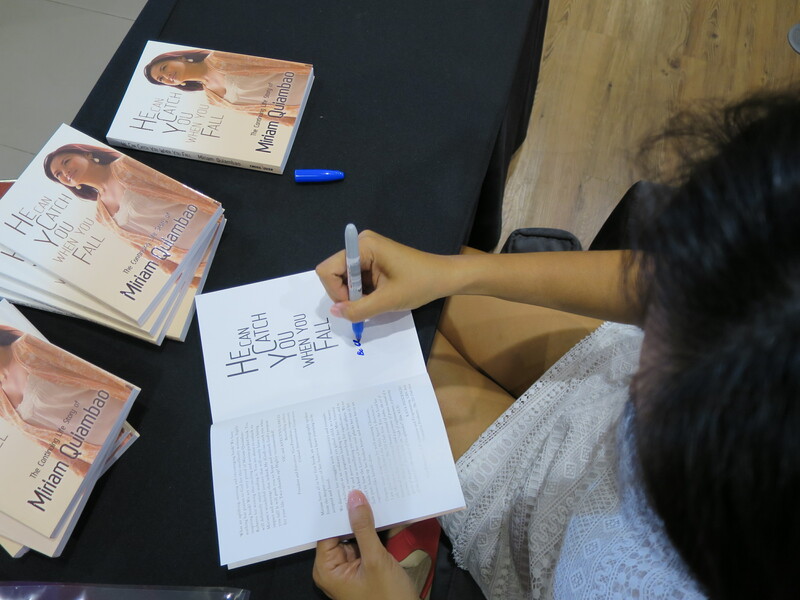 Just this Saturday, I also looked for her book in another National Bookstore branch, but it is also not available. Being a Christian believer myself, I’ve also experienced God’s greatness in my life – both in good and bad times, and what He did to Miriam’s life is indeed a manifestation that He alone can take us out of the darkness when we thought we never will, and He will always can catch us every time we fall along life’s difficult journey. winners 🙂 🙂 I look forward to be blessed and inspired by the book. I also hope to share it with my friends and family as well. Hi, Nanette! Since you are first to comment, I shall send you one. Pls. 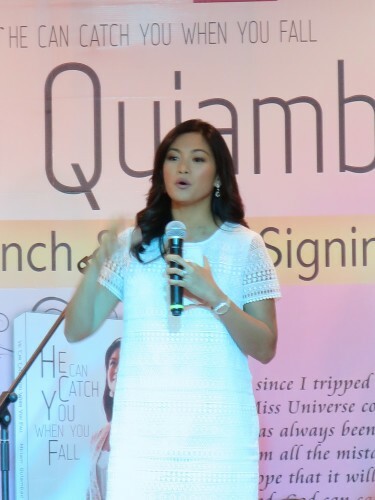 expect Ms. Judith Cantuba from our office to get in touch with you. Happy reading! Can I also have a copy? I hope i can share this book to my friend who is undergoing the same situation. I’ve been praying for her and my godson. Thank you for being a blessing to others ! Hi Maricel. 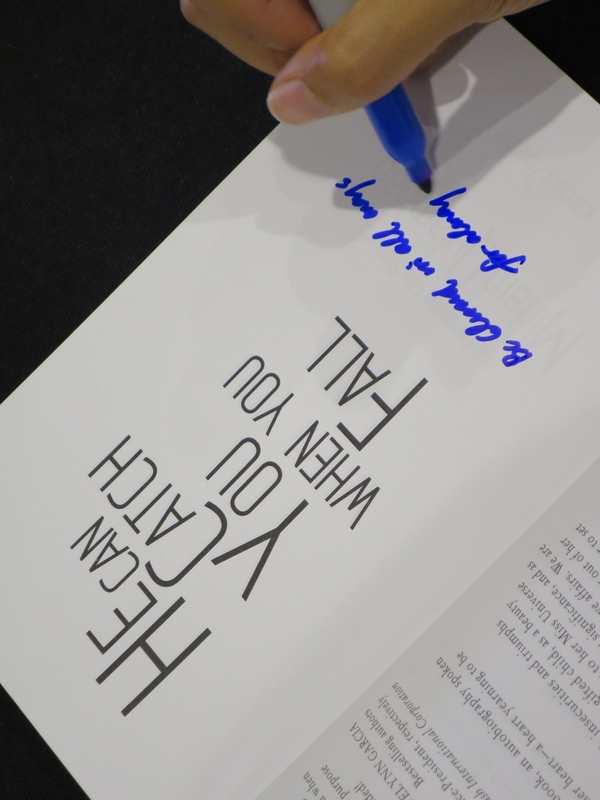 I have always been your fan and when I found out that you also blog and a triathlete despite your busy schedule, I immediately became a follower. I truly find inspiration from people especially moms who take care of their health and well being so they could live longer for the people they care for. 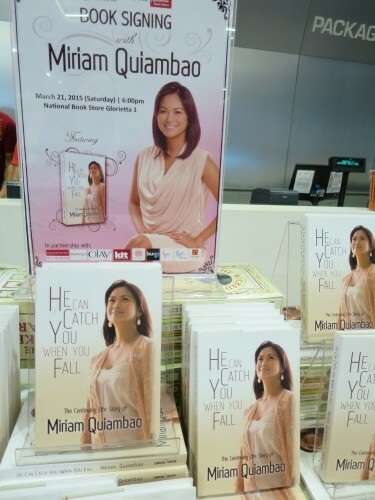 Thank you as well for featuring Miriam’s book “He Can Catch You When You Fall,” as well. 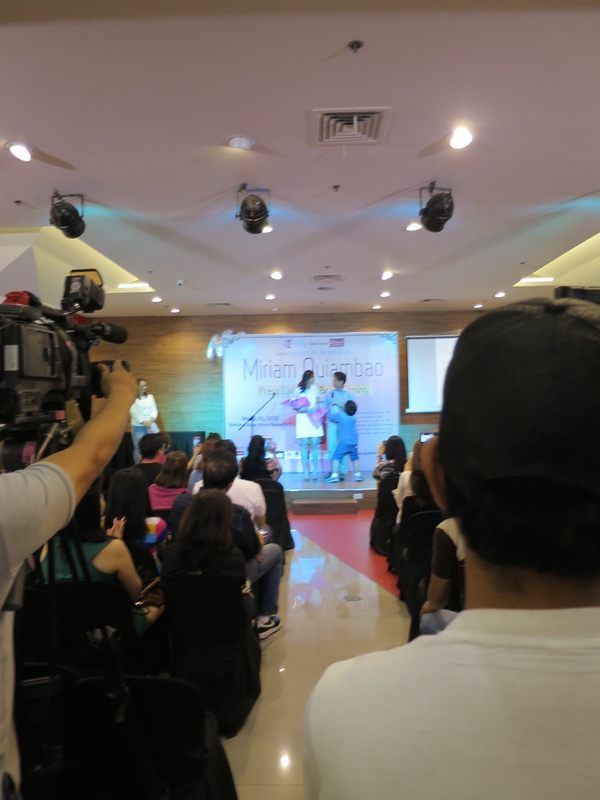 I have admired Miriam since she won first runner up at the Ms. Universe Pageant My daughter with autism and I also got the chance to see her at Pasay City Sped Center a few years ago. That daughter of mine now actively joins the Run Rio Marathons, easily finishing 10KM races. God bless you and your family and I really hope to see you soon. 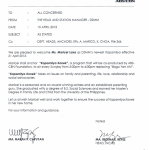 Hi Ma’am Maricel. Thank you for posting Miriam’s Book, It was indeed interesting as a Grown Woman I find this book a good reads for my soul. Last time that I saw her book was on sale and because I’m run out of budget I didn’t buy her book. Actually nagka interest talaga ako sa book na to. 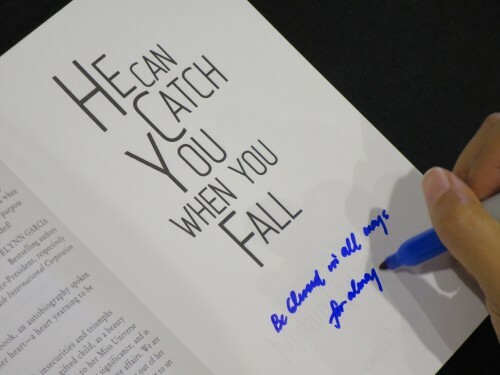 “He can catch you when you fall” Grabeeeeee pag si Lord Kumilos sa isang tao Wow na Wow. Right now, I feel that I really need to read this, The Lord catch me in my failure and now I’m on His work on progress.. I feel so loved!